I don’t frequent buffets, not like in my teens and early 20’s when we (literally, time and time again) took over China Palace buffet before hitting up punk shows. When I do go to a buffet, it’s always Zenith‘s Sunday brunch. That’s been a tradition for so long, and it’s the coolest atmosphere for a date with my honey. Despite my Zenith love, what I don’t love about buffets is the overly-full feeling I come home with. I don’t stuff myself silly, but I do tend to eat more than I would at any regular restaurant where I could take leftovers home with me. Hence, why I don’t frequent buffets! Sometimes, though, you just want a wide variety of foods to choose from and the ability to take the portion size you want. What other buffets lack in Zenith’s ambiance and character has to be made up somehow, right? Enter Loving Hut buffet. It’s not to be compared to Zenith (they’re both so different and so amazing to have for the vegan community in Pittsburgh), but it’s awesome enough that I’m willing to splurge ($16, yikes! ), and I don’t mind slipping into a post-meal food coma, which is a complete rarity for me. 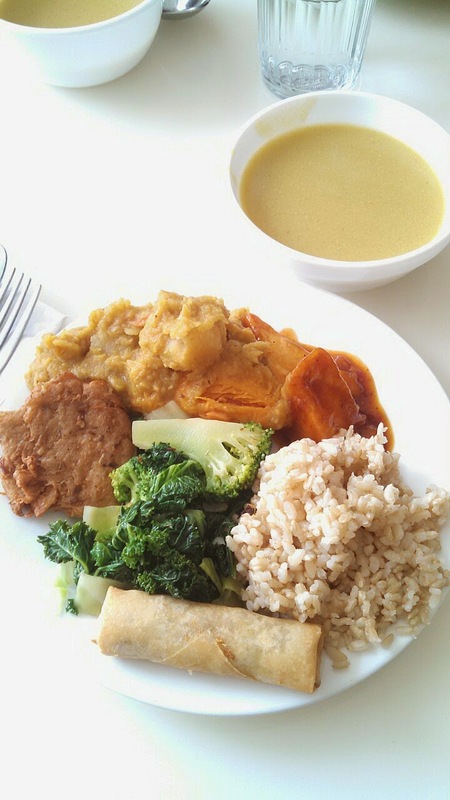 If you’ve never heard of Loving Hut, it’s a vegan chain restaurant that has over 120 locations worldwide. I don’t know how we were lucky enough to get a location in the Pittsburgh area, but it’s pretty awesome. It’s been in this area for years now, but I seldom make it out. I think it’s mostly because of the location. Living in the city limits, it’s much easier to run up the street for Thai food than it is to sit in Fort Pitt Tunnel traffic to make it out to the ‘burbs for a meal. Nevertheless, we’ve found our famished selves out that way a couple times and decided to stop in for a bite. The menu varies by location, though I’m not sure by how much. They do have a wide selection to choose from, ranging from the standard fare you’d find at any Pan-Asian restaurant to burgers. What stands out about them for me is that they focus on providing nourishing, wholesome vegan food. I have taken a particular liking to their hot and sour soup. This past weekend, J suggested we go to their buffet. He finally checked it out a few weeks ago and was eager to return. When he told me about their offerings, I couldn’t turn it down. So we, along with a friend of ours, drove out for a mid-afternoon gorgefest. Every Saturday, they set up a buffet with variety that you can’t get anywhere else. The food wasn’t overly oily or overly sugary which is a major plus for me. They had spicy tofu, crispy spicy tofu, garlic tofu, lemongrass medallions, sweet potato daal, pineapple seitan, chow mein, mongolian beef and vegetables, sauteed mixed vegetables, spring rolls, cream of broccoli soup, fresh fruit, fresh greens, ranch dressing, brown rice, fried rice, and pandan and/or chocolate cake for dessert. I couldn’t stop eating the pandan cake. I was too busy savoring every last morsel to catch a picture of it. It was bright green, moist, and nicely sweet with a dollop of whipped cream on top. No sugar bombs here.